Jack: Hi, my name's Jack. Jack: It's been two whole weeks since I last playtested Codename: Vacuum. I need help! Fortunately, that drought should come to an end at lunchtime today. I've a playtest session lined up with my office playtesting group of Chief and Dave, so fingers crossed we'll get our game on in a few hours' time. It's been a fairly quiet week, we didn't have a chance to test Vacuum this week as I was called into a surprise quality audit (fun!) on the day we'd booked it, and I've not done much in the evenings as I've been hanging out with my family instead, seeing as I was away for the whole week beforehand. All I have managed is printing, cutting out and inserting some updated cards for the June version of Codename: Vacuum last night and a start on the level 3 card art stolen from inspired by the Eclipse iPad app. They are the only deck where level twos are almost as good as level threes. It wasn't until I got my arse handed to me a couple of weeks ago in the first game of the June version that I noticed these things in combination made the Population deck a bit broken if you knew how to use it (it didn't help that I thought I did and was show otherwise by Dave!). I spent a week in Minneapolis for work as I mentioned here last week. It was a busy trip, attending a conference on Mass Spectrometry and I worked long days and several evenings. But I got two nights off, and rather than spend them cruising the hospitality suites at the conference for free food and beer, I chose to spend them playing games. 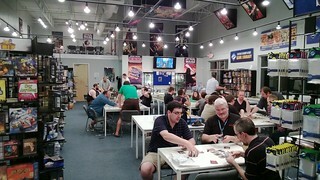 In the run up to my trip I posted on BGG, to see if anyone knew of a good gaming venue in Minneapolis, and several people replied suggesting either the Fantasy Flight Games Event Center or The Source. I had no idea that Fantasy Flight were based near Minneapolis, but upon finding out I dropped them an email to see if any of their design team fancied meeting up. I would have liked to have taken Codename: Vacuum, not to hawk it to them (though had they wanted to pick it up that would have been awesome! ), but just to get some feedback from some very successful designers. Sadly, other than the brief message from customer care, I didn't hear back from them. It turns out that even if I had, I didn't have room in my suitcase for Vacuum anyway. The post on BGG led to a couple of offers from gamers who were willing to pick me up downtown and run me over to FFGEC so I could get my game on. The thread quickly devolved into silliness though as they insisted they weren't axe-murderers! The first night, Alfredo and his mate Jay who worked downtown offered to meet me at my hotel and then drive me to FFGEC via a look at The Source. We got the light rail to where Alfredo had parked his car, then swung by Arby's for some dinner (apparently an authentic American dining experience :) ). We had a quick look at The Source, a huge store, the likes of which I've not seen in the UK - seriously, it was enormous! Then we rocked up to FFGEC. Ahead of time, I'd had a look through Alfredo's 700-odd games listed on BGG and offered to teach him the ones it looked like he hadn't played, but I knew well: The Bridges of Shangri-La, Aqua Romana and Hey! That's My Fish! In the end, we played those three games and Alfredo and Jay enjoyed Shangri-La and Fish, though Aqua Romana not so much. It was a great evening and Jay and Alfredo were great company. The next night, Fred picked me up from my hotel and drove me out to Brasa, a nice little restaurant serving food which I can't categorise, but thoroughly enjoyed along with nice beer :) Fred even offered to buy my dinner, but it was on expenses :) We got to FFGEC where we looked at the library and I picked out a few things I could teach: X-Wing minis, Lords of Waterdeep, Race for the Galaxy and Lost Cities. They had a decent library of games: at least a hundred, and not just stuff they made themselves, games from a wide range of publishers. The games cost $3 to hire, but for some unknown reason were free that night. We started with a game of X-Wing, during which I provided rules support for the guys playing on the table next to us too! FFGEC had a range of play mats, a couple of space ones, plus one of the Death Star trench run, which was all moulded and looked awesome! After that we played a couple of games of Race. Fred enjoyed both games and, in fact, bought X-Wing at the end of the night to play with his kids. I also bought a couple of things: the X-Wing minis dice pack that I've been after for ages and the extra wonders expansion for 7 Wonders - which includes Stonehenge :). I could just fit them in my suitcase! In addition to the two nights of cardboard gaming I took our iPad with me and spent the time at airports, on planes and in hotel rooms playing a variety of board games on it. I played Carcassonne, Hey! That's My Fish!, Ra Through the Desert and Eclipse; some solo, some with my boss Ian, a Games Night regular and my travel companion. I am particularly impressed with the iPad version of Eclipse, I bought it for the trip so it was new to me and it's very slick. It's also given me an idea for the level three Codename: Vacuum art. I've recently knocked the level one art up a notch, and I like the clean, webpage inspired level two art, but I didn't like what I've done for level three, and had no real idea how to improve it. Until I saw the Eclipse iPad version. Time for some plagiarism, sorry, I mean imitation. I enjoyed my trip a lot, especially getting to meet gamers from across the pond and introduce them to some of my favourite games. It's a testament to the BGG community that I had two adventures that began with 'I met a guy on the Internet, he picked me up in his car and drove me to an out of town location...' and they both ended with a convivial evening of food and games, not a headline on national news! I'm over in the US for a week to attend a conference for work. It's going to be a long week, I'm working morning till night three days and all day for two more (no time for sight-seeing! ), but I'm not letting that stop me get some gaming in. My boss, Ian and I flew over together. Ian is a Games Night regular, so I brought my iPad loaded up with games and we play a few on the way over. I imagine we'll play a few on the way back too. But that's still not enough, no, no. So I've arranged with a couple of guys on BGG to head over to the FFGEC on Tuesday and Wednesday nights for some more gaming! It's alright, they both promise they are not axe-murderers. I dropped Fantasy Flight an email to see if any of their design team fancied meeting up, but I've not heard anything since a 'I've forwarded your message on' email from their Customer Care team, so I'm assuming that's not going to happen. Clearly, I'm developing a gaming problem again. In other news, we tried out the new version of Codename: Vacuum one lunchtime last week. I want to make some more changes (as with the last new version a couple of months ago, the first stab at major changes often needs some early changes to fix unintended behaviour). But, in essence, the new, more complex, bits work. One of my playtesters was very excited about them. But then, he is quite excitable! Anyway, back on topic! Next weekend I'm off to America for a week with work so I'm trying to make some Vacuum progress before I go. Last week I had a game at lunchtime with Chief, trying out a couple of new rules that I'd thought of following Tim's feedback. They worked. I'm not yet sure that they are better, but they are interesting. I'll try them a few more times before making a call whether to stick with the old ones or switch to the new ones. The new ones work with the current version as well as the next one, so I tried them out with the current version, pending the new version being constructed. To the subject of this post, I was talking a few weeks ago about having Vacuum pretty much working and now needing to focus on simplifying things. Scratch that. It's time to knock it up a notch. BAM! One of the endgame conditions that you can try to score is for exploring the Solar System. In the current version exploration is pretty bland: you get points for exploring locations based on their range - the further away they are the more points you get. But all the ones at a given range give you the same points. Therefore, you always explore at the furthest range you can, but other than that it doesn't really matter which location you explore. Bland. Beige. Neutral. Tim spotted that it was boring. My playtesters at Beer and Pretzels spotted it, but I was clearly too close to it to spot it myself. When I started hearing 'boring' from multiple playtesters, it obviously needed some thought. So I've gone back on my word and started making things more complicated. I've given each location an exploration score that they will give the person who explores them. They generally increase with range, but at each range there are multiple options - so there's an incentive to explore early, and to choose one location over another. In fact, the locations are also being upgraded in other ways to make them even more interesting. Of course, until I try these ideas out I don't know whether they'll make things more interesting or just more complicated. Hence the need for testing and getting the next version made. With all the trips away we've had over the last few months, I've had this version on the cusp of ready for a few weeks now, if I don't get it ready this week, then I've got to wait another two weeks until my return from the US. The suspense is killing me. I need to get it done in time for Wednesday!